Our school is not just for llama owners. You do not have to have a llama to participate. We will happily assign one from our herd to you if you prefer. Our goal is to teach people how to be with llamas and llamas how to be with people in order to create a happy companion for each. Our classes provide an excellent opportunity to become acquainted with these wonderful animals while receiving hands-on manageability experience. During our many years of working with llamas we have spent a great deal of time cogitating about just what we are doing and why. As teachers, we found a secret mission buried in all our activities. We hope to show people how to connect with the land and with their companion animals. We delight in teaching interspecies communication and we are dedicated to teaching care and respect for the planet from the ground up; rocks, soil, plants, and animals included. We do this for several reasons. First, we love llamas and want to provide them with a purpose and useful work. They need to stay fit both mentally and physically. They enjoy working with people and they are healers and teachers in their own right who enjoy practicing their craft. Secondly, we work with llamas for our own benefit. 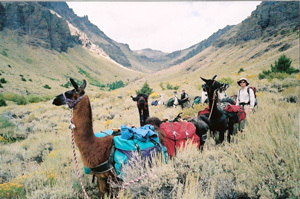 Besides the pleasure of being with these fascinating beings, our llama activities provide us with a chance to share our knowledge and watch other people grow from the experience. It also provides us with a forum for personal growth. Finally, all of this allows us to offer people a unique experience. Working with the llamas expands one's awareness while inducing a sense of wonderment and openness that promotes reassessment of one's life and an opportunity to grow. We are dedicated to designing activities to provide tools to increase interspecies communication, a gentle way to enjoy the land, and an opportunity for you to experience refreshment and spiritual renewal.